“The Stan” shares private thoughts, therapy sessions, journal entries, and memories of our family of four as father and son deploy to combat. A rare opportunity to experience deployment as we say goodbye, sacrifice for others, struggle inwardly, attempt to heal, and move on with life from differing, even opposing, perspectives. Observe unspoken emotions, hopes, and dreams common to military families. Dan Talley is a veteran of a twenty-six year marriage, twenty-eight year military career and three wars. His varied occupations include years of leadership in military, educational, industrial, religious, and civic organizations. God, through this experiential education, amassed within this storyteller numerous tales to be told. Dan is winner of both visual art and literary contests. His experience, quest for understanding, creativity, and artistry enable story-telling which guides others to comprehend truths from ordinary and extraordinary situations. 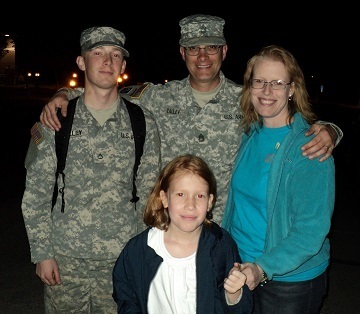 Serving in combat with his son in 2010 brought new perspectives on Jesus’ sacrifice and God’s love. Subsequent depression, suicidal thoughts, and PTSD, contrast with a mission trip in India to grow greater compassion for others and a desire to assist in their personal growth. 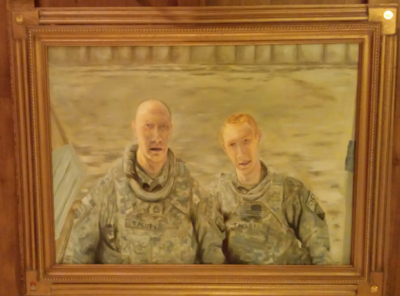 Josh, my son, and my combat experience together in Afghanistan and internal struggles in such context is one discussion you will read in our story. My son’s perspectives, my wife’s and daughter’s emotions, worries, and problems through a third deployment is another. I am Dale Sanderford. I am nothing special, just one of millions of men who understand his country is worth defending. One man who, like my son, believe our family, our freedom, our rights, privileges, and those of this country are more important than we are. Such difficult decisions were not my plan in 1986 when starting my military career. 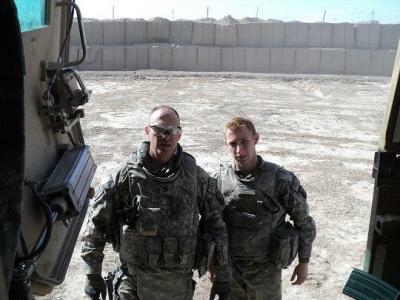 Who plans to see his son in a disabled gun truck on a road in Afghanistan, minutes after another firefight? After all, I went to Iraq in 2005 in an effort to end this. Every man’s hope as he goes to war is to “finish this so our children won’t have to.” Yet here we are. How does a man describe going into combat with his son? We could list facts as an intelligence report would. Karen, my wife, says we should share emotions, fears, and celebrations. How does any soldier, or spouse, communicate what he or she did, saw, and felt in combat? Not all civilians can understand or even care to try. Perhaps to review who we are and how we came to this point, we can communicate much of this. It is a difficult task. As with many returning soldiers, we do not know who we are now, and neither does our family. Perhaps our journey within these pages can lead us all: you, my family, and me, to who we are and where we go from here. Perhaps this telling will help us to find a purpose for life beyond places we have been and actions we have taken. Our family’s discoveries aside; we pray soldiers, families, and friends understand each other more as we express things many never say. "The Stan by Dan Talley is a soul-searing memoir….they give chapter and verse detail of the trauma of combat, its aftermath, and the real cost of it to those in uniform and loved ones at home. Those who have experienced what the Talleys have will understand. Those who have not will find in The Stan　a powerful work to help bridge that gulf." "…Veterans of any combat will recognize themselves in here. So will family members. Maybe seeing each other's stories in print will help bridge any divisions. For those that haven't been part of a similar story, this book will help you understand." "The Stan" holds nothing back – survivor’s guilt, crisis of faith, war’s negative effects families, veteran suicide, invisible wounds of war (PTSD and TBI), post-deployment career challenges - and offers powerful inspiration…"
"Dan’s words paint a picture that many have never even contemplated – the heartaches of the soldier and their families during combat and post-war as well." Josh, my son, and our experiences together in combat and my internal struggle in such context is one discussion you will read in our story. My son’s perspectives, my wife’s and daughter’s emotions, worries, and problems through a third deployment are included as well. I am Dale Sanderford. I am nothing special, just one of millions of men who understand his country is worth defending. One man who, like my son, believe our family, our freedom, our rights, privileges, and those of this country are more important than we are. Such difficult decisions were not my plan in 1986 when starting my military career. Who plans to see his son in a disabled gun truck on a road in Afghanistan? After all, I went to Iraq in 2005 in an effort to prevent his deploying. Every man’s hope as he goes to war is to “finish this so our children won’t have to.” Yet here we are. Perhaps to review who we are and how we came to this point we can communicate much of this. It is a difficult task. As with many returning soldiers, we do not know who we are now, and neither does our family. Perhaps our journey within these pages can lead us all, you, my family, and me, to who we are and where we go from here. Perhaps this telling will help us to find a purpose for life beyond places we have been and actions we have taken. Our families discoveries aside, we pray soldiers, families, and friends understand each other more as we express things many never say. It is easier to remember where things happened than it is when. Like Smith picking his nose and wiping it on our interpreter Mahmud’s shirt as he slept. Which mission it was and when we were there is unclear. We remember winter versus summer based who was in our truck and cold, wet, hot, or dry. However, specific dates escape our memory, due to monotonous boredom, and indifference to such information. Only when R&R leave draws near, or it is time to come home, are dates or even days of the week relevant. Within military families, numerous emotions, experiences, hurts, pains, and fears remain unspoken. Often, the only way for a relationship or an individual to remain healthy is to discuss most if not all good or bad experiences. Once we admit our issues, we can discuss them, attempt to understand and grow both as individuals and in relationship with others. This book is not a lesson in political correctness, openness to others, or acceptance of others’ beliefs. It is not an attempt to offend anyone. Instead, we share thoughts, ideas, and emotions from different times, experiences, and seasons of our lives, both the positive and the negative. While some people will take offence by our family members’ honest thoughts, we do not imply this represents all service members, nor attempt to convince, satisfy, or push any agenda on a reader. This is our story, and we are sticking to it. My wife and I have been married for twenty-eight years. To her, I have to say thank you for being my support, my home, my love, my counselor, and my nurse all those years. In no way could I have done what I have without you by my side. Thank you also for including your perspectives in this text. Hundreds of thousands of military spouses sacrifice to support our nation’s conflicts. Such dedication is often unappreciated, unrecognized, misunderstood, and glossed over by political noise. This is difficult as you stand next to your service member who has been through so much to come home. Who must learn a new way to live. What we have gone through as troops is only half a story. Karen for your unwavering support and love, your willingness to share your journey, I thank you. Josh is twenty-three years old and the pride of my life. Knowing he watches pushes me when I want to quit. I pray his son brings him similar motivation. Josh’s intelligence, questions, honesty, and perspectives included here expand this text from an old Joe’s book to contrasting perspectives on war. My daughter finally stopped saying, “I like pie” any time emotions come up. Even commercials on a cartoon channel would cause her to blurt out, “I like pie.” Our nine-year-old daughter’s additions to this text surface buried emotions. Reading her thoughts as she experiences this war is enlightening, heart breaking, and hilarious. I love my little girl and am so proud of who she is after all her struggles. I am glad we are writing this book. We feel it is what God wants. Published or not, does not matter. It is good to put down our feelings, gratitude to God, and other details of our journey. We pray God uses this book for His glory. We want to reach out to people on a similar path and say there is hope, and you will make it. Soldiers, first responders such as Firemen, Policemen, Emergency Medical Technicians, and others in harm’s way live out their lives in constant anxiety. Such a life takes a hard toll. We hope our experiences offer some spiritual truths and practical tips to help them cope. I would not want to live these last few years over, but I would not want to lose things gained from it either. I have seen strength in our marriage, and it is solid, rock solid—thanks be to God. You wonder sometimes through the busyness of life if your relationship with your spouse has the moxie to see it through any situation. As Post Traumatic Stress Disorder (PTSD) hits home and everything familiar is lost. If you find your marriage has that moxie, you are thankful. When a test comes to put our relationship under fire, it withstands the heat and we realize what seemed mundane was consistent training for an intense time yet to come. Dale supports me so often, in therapy for “my issues,” three children’s births, loss of one, college, work, and life’s insecurities. I have waited all my life for this moment, for a time to stand by my husband when he is totally lost in a world unfamiliar to him. I will guard him with my life. When he believes he should leave us through suicide. When his mind does not work, he feels people stare or talk about him. When he watches both military and civilian careers slip away in a few short weeks, everything he built through a lifetime of education and service disappears. I will stand by my husband. I will believe in him. God will do it through me. Each day and sometimes each moment God gives His word to assure, He is helping me. I now clearly see his assurance in our journey. I am at my best, my strongest, when I lean most on God. He works through our faith. When we agree we need Him and accept He loves us and our battles REALLY are His, the journey with Him is amazing. I have learned not to care about Dale’s career or having a nice home. I care about Dale and about our family. A test by fire burns all chaff away and gives a renewed sense of living, a clean slate allowing for choices as to where to go from here. Dale and I want to stay close to God and continue praying for His direction. Please pray we will keep our newfound intensity and desire to seek Him in every area and not to fall back into a routine or mundane life. We would be most grateful. We pray the same for you. Many of our friends lost marriages during or after our deployments. Others lost jobs, other relationships, and some even lost their entire social structure. Our family has dealt with three conflicts over as many decades. Each was different. Just as we approach each one with a varied perspective and purpose, each has a different effect on us. Our third deployment completed a set of experiences to create within me depression and Post-Traumatic Stress. Mental and physical limitations prevent my being who I was, doing what I did, or understanding what to do next. We hope our story will lead readers to understand themselves better, to support, and love each other. I Am not who I was. God, counselors, and family help me learn how to live again, to become someone new.